Sewing a quilt and giving it as a gift is gratifying. Sewing a quilt for someone in need or who is going through tough times shows compassion. Most importantly, the recipient feels loved. Win. Win! 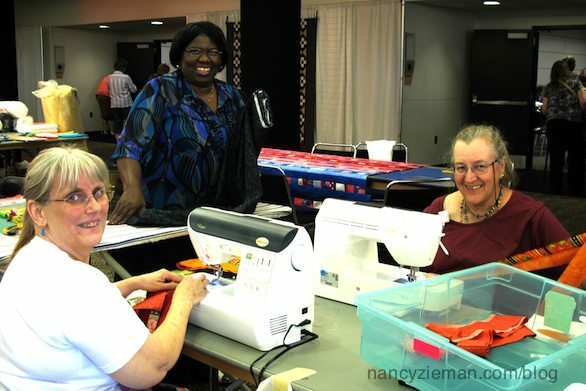 This will be the fourth year that the Quilt to Give quilt pattern will be sewn and quilted during the annual Quilt Expo in Madison, WI, September 10–12. If you aren’t able to be at the event, you, too, can make a twin-sized quilt, then donate it to a local shelter or charity. I made the first Quilt to Give design in 10-days, sewing a little each day. I chronicled the 10-day journey with full instructions on how to make the quilt on my blog. My hope is that sometime in the near future, you or your quilting group will consider making this easy quilt design made with columns instead of blocks and then give it away. Hence the name Quilt to Give. The project will again be the community service project at our annual Quilt Expo, Last year over 25 twin to queen-sized quilts were made and/or donated by participants. I know that I’ll see some of my blog readers at the Quilt Expo in Madison, WI, September 10–12, 2015. For most of you, the logistics of attending aren’t in the cards. Yet, I encourage you to make one of these easy Quilt to Give projects with the intent of giving it away! This year we’re asking for twin-sized quilt donations—that is the size we’ll be sewing during the event, too. Why? The two organizations that will be receiving the finished quilts, Enchanted Makeovers and Domestic Abuse Intervention Services (DAIS) both requested this particular size. Enchanted Makeovers services women’s shelters and Domestic Abuse Intervention Services (DAIS) is a woman’s shelter with twin-sized beds in each room. Download the twin-sized quilt worksheet. Click here to download the twin-sized quilt worksheet. It will assist you in sorting and cutting fabrics. Sort fabrics from your stash. Begin by selecting a print or prints that will be used as the inspirational fabrics. Then choose other fabrics that coordinate with the inspirational fabric. Gather solid-color fabrics that coordinate or match with the inspirational fabrics. Choose many solids or mottled fabrics (subtle prints that appear as solid colors from a distance) as possible for this project. Click here to read the full lesson on sorting fabrics. Determine which fabrics will be the outside columns (the more solid the better) and which will be used for the scrappy center columns. Fill out the worksheet to denote which fabric colors will go where. For links to all 10 Quilt to Give lessons, click here or visit QuiltToGive.com. During our first community quilting project, a donation of four yards of striped fabric with a salsa flavor was given. Great donation, but it just didn’t seem to fit with any other fabrics. The gift is in the giving! I enjoyed reading all your comments regarding my new Swing Jacket pattern from my blogs on August 11 and August 18. The winner of McCall’s pattern M7201 is Diana G. She said: Oh so many fabrics one could make this out of… but I think velvet would be the preference for me. Thank you for the chance to win! Nancy Zieman—author, pattern designer, businesswoman, producer, and national sewing authority—is the host of the popular show Sewing With Nancy, which appears exclusively on public television stations across the United States and Canada. Follow Nancy’s blog at NancyZieman.com/blog and sign up to receive Nancy’s E-News for the latest news in sewing, quilting, & creating. Hi, Jakie! You may try checking with a local church, hospital, or shelter to find homes for your quilts. Does anyone have ideas on using washable wool for blankets and or quilts,I have yardage enough that I could just serge around, and some I will need to piece, what kind of back or do I need to back it? I need to get these things out of my house and for someone to use!!! THANKS for the info. I am very excited about the quilt to give away. I started a quilt group in the small town where I live about 2 years ago. I am always on the look out for projects for the group to do. There is only five of us that are active all the time. We have given 3 QOV, 1 quilt to raffle off for the Community center, and our present projects is about 20 lap quilts for an assisted living. I know that our next project be the quilt to give. Thank you so much for all the ideals that you come up with. Love and hugs, you are a part of more lives than you know. Thank you for all the sewing and quilting tips, and sharing your life with us, — and we wish you a good recovery from your latest hurdle, and please know we send good wishes from all over America and beyond. Oh wonderful .. Just in time for me to make a quilt or two over the winter to give .. THANK YOU !!! Thanks for the pattern I have a friend in this town that is going thru very hard times and they have 3 little girls 1 a baby and she needs quilts for the winter I am going to try and make a few of them for her with all my scraps. Perfect timing, Nancy! As an R. N.. I began a mission 9yrs. ago to make quilts fo patients of all ages with critical/terminal diagnoses. Eight other dedicated people have stayed with me through the years to put together our 1250+ quilts with all donated materials. As you can imagine, some fabrics are challenging. Your pattern is great! Easy enough for beginning sewists, it not only allows ideas for unusual prints, but also for twin sizing! Thank you! Thank you for the pattern, Nancy. You have such a generous spirit! The pattern will make charity quilts exciting and quickly made. The hard part will be choosing the fabrics.